A Short Guide to the Cost of Dental Implants in Spring Lake! Before making any type of investment, it’s important to do research beforehand so you can weigh the pros and cons and make the right decision. If you’ve lost any teeth, one investment you might be considering is dental implants in Spring Lake, which will undeniably improve your oral health for many years. But one of the first questions many people have is how much they cost. Keep reading to find out what the average cost of an implant is and which factors can affect the total cost. With this information, you’ll be that much closer to making the best decision for your oral health! For a single implant, the average cost is between $3,000-$4,500. However, the cost can vary quite a bit depending on your goals and medical and dental history. That’s why the best way to get a cost estimate is to schedule a consultation with an implant dentist who will closely evaluate your needs so they can recommend the best treatment plan for you. Extractions or gum therapy – If you have failing teeth that need to be extracted or gum disease that needs to be treated before an implant can be placed, those costs will be factored into your treatment plan. Bone grafting – If you’ve been missing teeth for a long time, you may have lost a lot of bone mass in your jaw. In these cases, a bone graft might be recommended before an implant is done to provide it with the necessary support. A single implant – A single implant is completed with a dental crown after it’s fully healed. The cost of the crown is factored into the total implant cost and is typically the same as a regular dental crown. Multiple implants – If you have multiple teeth to replace or you want an implant-retained bridge, the cost will vary accordingly. An implant-retained denture – If you’re missing all the teeth in one or both arches, you may be a good candidate for an implant-retained denture. 2-4 implants will be placed per arch, which are significantly smaller than regular implants. The cost for this procedure includes the denture and will vary quite a bit from the cost of regular implants. Are Implants Worth the Investment? While it’s true that implants initially cost more than other options such as bridges or dentures, there’s more to the story than that alone! Most dentures last an average of 5-8 years, while bridges last about 10. The cost of replacing this dental work really adds up over time, not to mention the ongoing re-lines and adjustments that are necessary to keep a denture fitting well. Implants are a fantastic investment in your oral health because they look and feel more natural than any other option – and last much longer too! Dr. Edward Dooley is a general and implant dentist in Spring Lake who knows that cost is one of the biggest priorities for many of his patients. That’s why he always keeps his patients’ budgets and long-term needs in mind when he makes recommendations for tooth replacement. If you’d like to know more about dental implants, he can be reached via his website or at (732) 974-2288. 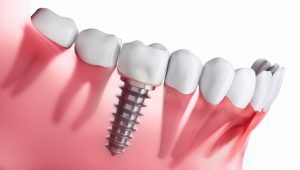 Comments Off on A Short Guide to the Cost of Dental Implants in Spring Lake!